Each room can hold 110 people. Room Fee: Sun-Thursday: 1 Room: $875 2 Rooms: $1375 Friday: 1 Room: $1275 2 Rooms: $1775	Saturday: 2 Rooms: $1975 Bar Fee: $125 (for use of the bar) ______________________________________________________________________________ Corporate/Hr room rate $150 per room. Sunday – Thursday 6am-2pm All other amenities extra. 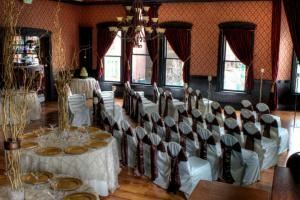 Atmosphere/Decor: A VINTAGE CLASSIC: ARCHITECTUAL FEATURES WITH THE CHINESE TURRET, ROMAN FLOOR TO CEILING WINDOWS OVERLOOKING DOWNTOWN BOISE AND OUR BEAUTIFUL WALNUT FLOORS.! Atmosphere/Decor: Rustic Elegance , multiple chandeliers, high wood beams, original German brick wall from 1906 create a warm intimate space. What a great space and Gene was wonderful to work with! Thank you! Special Features: We do your set up and take down. Little decor needed..